1. Introduction: Abdominal pain diagnosis when appendicitis is suspected is based on clinical findings. However, near half of these patients have atypical or equivocal presentation signs and symptoms. When the result of evaluation is unclear, diagnostic imaging alternatives are used; if unavailable, patients may be discharged undiagnosed. Every year in the U.S., near 100,000 patients develop perforated appendicitis due to delayed or incorrect diagnosis, and nearly 98,000 unnecessary appendectomies are performed. These errors cost over $2.4 billion a year in hospital charges, lost wages, and medical malpractice lawsuits. 2 Objectives: Development of a device and procedure to rapidly assess abdominal pain in the emergency room for patients with suspected appendicitis and unclear symptoms. The procedure is based on direct visualization of abdominal structures under local anesthesia and sedation. 3. Methods: The patented device Trocamera has been developed comprised by three systems: space creation, visualization and navigation control. First tests were carried out on corpses to assess basic functionality; and in a living swine to assess usability in real conditions. Prototype was improved based on these findings and evaluated by three surgeons in recently deceased human bodies, who assessed usability in terms of: usage understanding, comfort, ease of control, and structure recognition. 4. Preliminary results: The usability evaluation of Trocamera showed that it is possible to generate a space large enough to identify structures with minimum fatigue and satisfactory navigation control and orientation. Visualization quality is enough to recognize structures, but does not match laparoscopic standards. 5. Conclusions: The main innovative features of Trocamera are the means to generate a working space that enables efficient visualization of intrabdominal structures, and a navigation arrangement to control image capture. Visualization quality, although paramount for an accurate diagnosis, is not the focus of the research since this has already been solved. 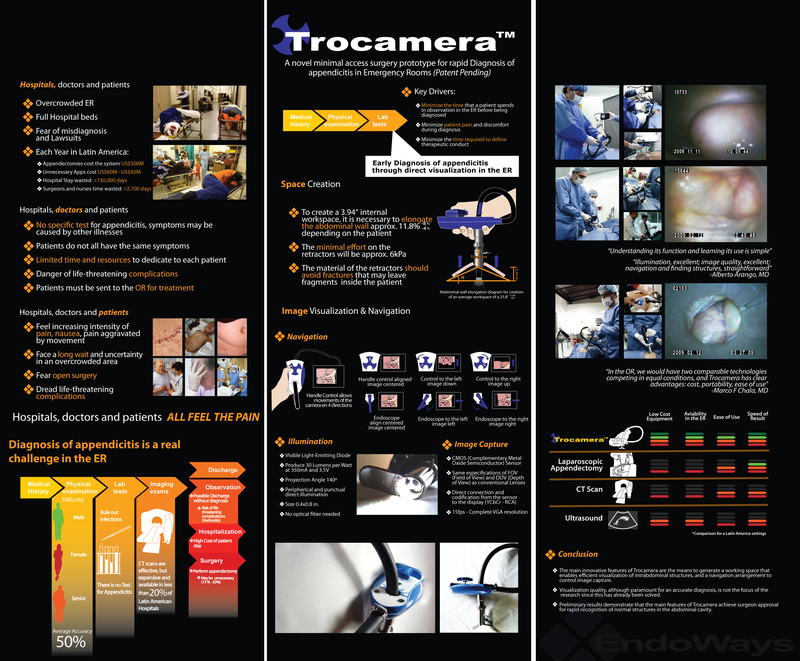 Preliminary results demonstrate that the main features of Trocamera achieve surgeon approval for rapid recognition of normal structures in the abdominal cavity.